The Hotels in Nawalgarh do not number many but they are sufficed to cater to the needs and demands of the tourists who want to witness the fine frescoes of the grand havelis. As it is moderately less popular than many of the other destinations of Rajasthan, the influx of tourists too is relatively less. So you can savor the artistic skills displayed by dexterous craftsmen in the palaces amidst a very peaceful ambience. The Hotels in Nawalgarh provide luxurious accommodation, tasty food and a fine range of comprehensive and efficient facilities to ensure that a visit to Nawalgarh remains etched in the minds of visitors forever. 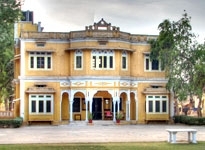 You are also sure to get a taste of quintessential Indian hospitality too when residing in the Hotels in Nawalgarh. The competent staff of the Hotels in Nawalgarh is determined to take care of you in every possible way and make your trip truly memorable.